Although there is no scientific evidence to support that there is such a thing as negative calorie foods, there are a great number of people claiming the negative calorie diet was responsible for them losing weight where other diets had failed. First of all may I say that a diet based on negative calorie foods are not for everybody considering weight loss diet programs, like many things, it takes willpower and commitment to be successful. Although there are pros and cons, as with any weight loss diet, I have read many testimonials praising it and how it worked for them. This is not a recommendation for a diet based on negative calorie foods, but information I thought may be useful if considering how to lose weight. It is not meant as a “stand alone” diet, but comple­mentary to an already healthy or weight loss diet. The word negative calories is a bit misleading, so don’t go looking for foods that contain no calories at all, you won’t find them, as everything you eat contains calories. You may find them sometimes described as zero-calories but all this means is that they contain less calories than the body needs to digest them. Most beverages contain calories, apart from some like water and green tea, which contain no calories unless additives are added. You can squeeze a few drops of lemon juice and/or lime into the water if you wish, which will add a bit of “zing”. Although most fruits are acidic, they will alkalize when drunk, this will help your body maintain the optimum pH of 7.3-7.5. How do negative calorie foods aid weight loss? Quite simply, they are the reverse of consuming more calories than your body needs, where the excess calories are stored as fat. Negative calorie foods are so low in calories that they don’t provide the energy that is needed on a daily basis which is generated by eating foods that are moderate or high in calories. As a result your body will draw on its fat reserves to release the amount of calories needed to supply the extra energy required, resulting in weight loss. One of the advantages of this diet is that you need never be hungry. Whenever you feel hungry just eat whatever negative calorie foods you fancy until you feel satisfied, but don’t overeat! For example: There are 25 calories in 100 grams of broccoli, but your body requires 80 calories to digest it. This means you have lost 55 calories of body fat. In the table Herbs and Spices I have included the number of calories in one teaspoon and one tablespoon as well as 28 and 100 grams as these will, most likely, be the ones you will use. It is unlikely you will ever consume the amount of calories in negative calorie foods to supply your daily energy requirements so your body will make up the shortfall by drawing on its fat reserves, again resulting in weight loss.are there any other health benefits apart from weight loss? If my research is anything to go by, yes there are. Can boost your metabolism, reducing fat-storage. May considerably increase your overall energy. Can act as a gentle diuretic, which helps eliminate excess water from your body. Can help remove toxins, improve digestion, cleanse the colon and liver, the organ which is responsible for burning fat. It is also claimed they will lower blood cholesterol levels; help relieve stress, anxiety and depression and promote better sleep patterns, giving more restful sleep. Using them as part of your weight loss diet. As negative calorie foods require more energy to digest than they generate, even if you don’t use them as a negative calorie diet, prepared properly you can use them as no-fat delicious between meals snacks to complement your normal weight loss diet. If you do decide to try the negative calorie diet then it should be used for seven days, no more, no less. It may result in rapid weight loss, depending on the individual, which is unsustainable in the long term and decidedly unhealthy. It is also lacking in some minerals and vitamins and certain fats and oils which are essential to good health. After seven days revert to a healthy well-balanced diet for the next 3-4 weeks before starting on the next seven day negative calorie diet, this will give your body time to replenish the essential nutrients it needs.That’s it for negative calorie foods. 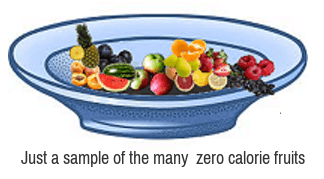 On the following page we’ll take a look at Diet – Empty Calorie Foods, not exactly what the name implies.